What's Better than a Fudd Burger? A FREE Fudd Burger! Purchase one 1/3 LB Burger & two drinks and get another 1/3 LB burger FREE! Just show your phone, take a screen shot or print to redeem this offer at any Upstate Fuddruckers locations! * Here's the fine print - must present coupon. Not valid with other discounts/promos. No substitutions. Craft Specialty toppings extra. Dine-in only. Tax not included. Valid until 4/14/19. 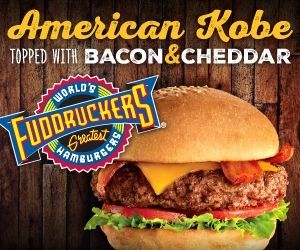 Upstate Fuddruckers locations only. It's our TWO for $20 so you and your favorite person can each enjoy a 1/3 lb Burger, 2 orders of Fudd Fries, 2 drinks & a hand-scooped milkshake to share! For the parents that can't get away for a date night, we've got you! The kids will think their meal is just as sweet and hey, maybe they get to share your milkshake?! Did you know we give our locals 10% off year round at our Myrtle Beach locations?! We want to take care of our locals even in the busy season but with the tourists away, now's the time to easily grab this deal! It's simple, show us you're a local or mention the ad and we'll give you 10% off. Fudds wants to give to you, the gift-er, and the gifted! For every $25 gift card purchased, we'll give you a $5 reward card. The $5 reward card can then be redeemed at any location during the months of January & February. 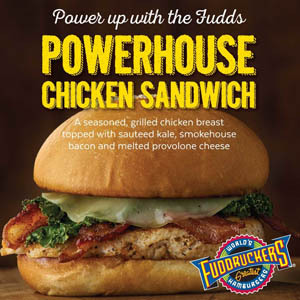 Stop by your local Fudds to grab your cards or place an order here online. Kids Eat Free in Sevierville, TN! It's a Big Deal for your Lil' Fudds! We're giving all our kiddos who dine-in with us a FREE kids meal Monday - Wednesday after 4PM. Check out our Kids Menu and let them decide which kids meal is their World's Greatest! So here's the details - it's dine-in only Mon - Wed after 4PM for kids 12 & under, each child receives one free kids meal from the kids menu per adult meal purchased. Available at our Sevierville, TN location in January and February! It's the tastiest back to school special yet! We're giving all our kiddos who dine-in with us a FREE kids meal Monday - Wednesday after 4PM. Check out our Kids Menu and let them decide which kids meal is their World's Greatest! So here's the details - it's dine-in only Mon - Wed after 4PM for kids 12 & under, each child receives one free kids meal from the kids menu per adult meal purchased. Available at our Upstate locations through September 30th. The Hottest Burger in Town is Back! The award-winning Sriracha Pimento Cheese & Bacon Burger is here again! Choose your favorite size burger and top it with Pimento Cheese, Smokehouse Bacon and drizzled Sriracha Sauce. Have you tried our other "burger" options? It also tastes awesome on our Buffalo, Chicken or Turkey burger too. It's here from now until October 7th so we'll see you soon! 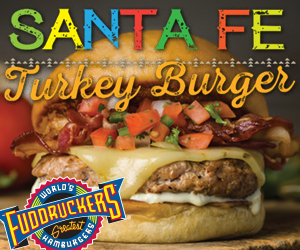 Available at your Upstate, Myrtle Beach & Sevierville Fudd locations! Our new Peanut Butter & Jelly Shake gives you a twist on an old classic fave. Our vanilla shake is blended with Smucker's strawberry preserves and a smooth peanut butter sauce topped with our made-from-scratch peanut butter cookie!Enjoy this shake next to your burger or grab it for an afternoon pick-me-up! It'll be available at our 5 Upstate locations all summer, now until September 9th. That's right, our favorite deal is back again! Starting Monday, March 26th, grab a 1/3 LB Burger & Wedge Cut Fries for $5.99 at any of our Upstate Fudd locations. We'll have this offer available everyday of the week for lunch and dinner so you can get your burger fix anytime! 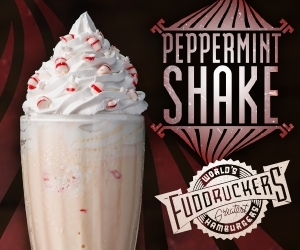 Our newest shake will please any Andes Mint lover. Our hand spun Vanilla shake is blended with a hint of mint and plenty of crushed Andes Mint chips. And of course, topped with whipped cream and a cherry. It won't always be here so come taste this fresh shake now! 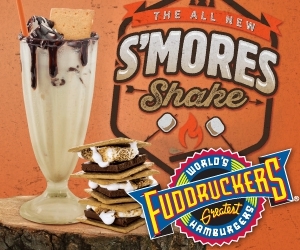 OUR OWN BRIAN TIMMONS WINS NATIONWIDE FUDDRUCKERS CONTEST! Brian Timmons, director of catering for Fuddruckers Upstate, won a nationwide Fuddruckers contest called Fudds Choice. The contest involved inviting all franchises and corporate Fuddruckers nationwide to submit a burger to be selected as a new menu item. Timmons submitted his recipe, the sriracha pimento cheese and bacon burger, and was selected as the top winner.